If you’re travelling with Emirates on an upcoming flight, here’s everything you need to know about your Emirates baggage allowance, restrictions, fees and charges. Economy: customers are permitted one piece of carry-on baggage, either a handbag or laptop bag, that may not exceed 55 x 38 x 20cm and must weigh no more than 7kg / 15 lbs. First Class and Business Class: customers are allowed two pieces of carry-on baggage: one briefcase plus either one handbag or one garment bag. The briefcase may not exceed 45 x 35 x 20cm; the handbag may not exceed 55 x 38 x 20cm; garment bags can be no more than 20cm thick when folded. The weight of each piece must not exceed 7kg. Passengers travelling with infants can bring a carry cot or a collapsible stroller if there is room in the cabin, if not, the item can be checked into hold free of charge. For Canada, North America and South America, different baggage allowances apply. Business Class and First Class: 2 bags up to 32kg each. For more information, please visit the Emirates website directly. Excess baggage charges on an Emirates flight will again depend on your fare and also your destination. Emirates provide an online baggage calculator to help you determine your excess baggage costs. These prices can vary on a number of factors. 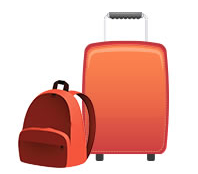 Emirates offers a very generous complimentary baggage allowance for all passengers. However, purchasing excess baggage on an Emirates flight can be very expensive and increase the overall cost of your journey considerably. It therefore makes sense to seek a more cost-effective alternative – such as a low cost luggage shipping service. That’s where My Baggage comes in. My Baggage provides an excellent luggage shipping service to over 200+ countries at a great low cost (starting at £16.99). Our fast and convenient luggage shipping services allow you to travel hands-free. It means you’ll save yourself some time at the airport when you don’t have to check-in your bags, no waiting around at luggage carousels on the other side and ultimately, one less thing to worry about whilst you travel. Customers receive full door to door luggage collection and delivery as well as access to online tracking. We offer fast delivery times and great customer support.